I have been to Tacloban, Leyte on business many times but I never had the chance to enter the Santo Niño Shrine. I can only admire its beauty from afar. 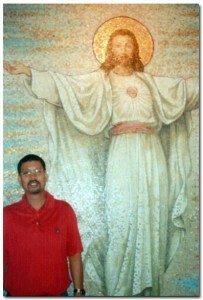 Hubby was lucky that he was able to enter and explore the Shrine when he visited the place in 2008. The Santo Niño Shrine used to be one of the 29 presidential rest houses of the late Philippine President Ferdinand Marcos. Behind the shrine is an Olympic sized swimming pool. 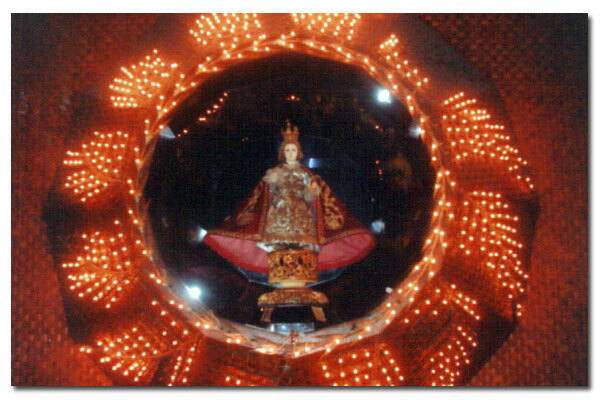 The image of Santo Niño is found at the far end of the entrance of the shrine. The shrine is located in Real Street, Tacloban City. Paintings of the 14 stations of the Cross done by Filipino artists, wooden bas-relief of the legend of the First Filipino man-woman (Si Malakas at si Maganda); tastefully decorated guestrooms of varied Filipino motifs; image of the Holy Child; a collection of original paintings by Fernando Amorsolo; spacious ballroom; priceless. collector’s. This entry was posted in Churches, Ruby Tuesday, Tourists destination and tagged church, churches, Santo Niño Shrine, Santo Niño Shrine Museum, tourist destination, tourist spot, vacation house of the Marcoses on December 14, 2010 by Yami.